Are you thinking to use link building tools for your blogs and websites but confused which you should choose? There are hundreds of link building tools are available in the market which claims itself No#1, but you can’t try all. That’s why I asked around 50 industry experts about their link building campaigns. Which all tools they use and how these tools helped them to reach the top. GSA Search Engine Ranker, URL Profiler, Link Prospector, Tiny Ranker and Screaming Frog also. Ahrefs: I would use Ahrefs to see who links to my competition and which links I should be going after. BuzzSumo: I would use Buzzsumo to help me determine what content to create that generates the most social traffic. As some of those visitors will end up linking back to your site. Adobe Illustrator: And I would use Adobe Illustrator to create infographics. Infographics generate more backlinks than blog posts, or at least that is what we have seen at KISSmetrics. Similar Web: Great tool to gather specific insights about any website, as search engines rankings, traffic, audience data, and social stats. NetPeak Checker: Fantastic software to check different SEO details. Great to get an analysis of the leading SEO parameters of specific pages or websites, plus competition analysis and comparison. SerpBook Rank Tracker: A powerful rank tracker. Good to check different data for your website campaign, as for example keyword rankings. Ahrefs: My number one "tool" for doing SEO is obviously Ahrefs. It helps me to dig into competitor backlinks and probably gather some low hanging fruits (links) for my project. This also helps me to determine the level of competition going on for a particular keyword/niche. Gmail with YesWare: the Second tool in my list is Gmail with a combination of YesWare. This helps me to track my outgoing/received emails for link prospects. This can easily be replaced with a buzzstream, but I'm a bit old-school SEO, so I prefer to Gmail. Broken Link Finder: And the third tool would be brokenlinkbuilding.com. This is software that scrapes together a list (for a keyword) of pages that are either down or go to 404 error page. This helps me to find tons of broken link building prospects. Inbound Writer: I use Inbound Writer to come up with my keywords and the URL slug for my blog posts. They use predictive analytics, and their service helps me create content that gets 2x-3x the amount of traffic I used to get. Majestic SEO: It helps me see the backlinks and rankings of both my site and my competitors. Alexa: I also use Alexa to keep track of my audience demographics and geography as well as my rankings. I love to perform link building manually but to get help in the campaign I mostly use Majestic SEO, Ahrefs, and Google Webmasters primarily. These tools help me understand which all sites are linking to me and also how they are linked and this helps me figure out which links are good and which ones are bad. By this, I can disavow the bad links to stay safe. I can also get to know how many dofollow links my site is having and how many nofollow. It helps me decide how much more quality backlinks either dofollow or nofollow are required to rank well. I just shared the 3 tools above, but I use much more such as WebMeUp, Open Site Explorer. If it comes to automation of link building which can be done for event blogging, then I would Suggest GSA Search Engine Ranking. Open Site Explorer: I would use Open Site Explorer to review competitor links and assess my site's link profile. Excel or Google docs: I would use Excel or Google Docs to manage and record new links. Gmail: And I would use Gmail for my outreach. It’s pretty simple. :-) But this is still the most efficient way to build links. Moz: I personally use Moz tools as the tools used in Moz are not only made my SEO professionals, but they are easy to use even for SEO beginners. They also give access to Open Site Explorer where you can actually figure out your competitor keywords and the number of backlinks so that you can outperform your competitors in search results. Google Keyword Planner: No matter how many keyword research tools are available, according to me, nothing beats Keyword Planner by Google. You can quickly figure out the best keyword ideas for your blog posts, and you can also estimate the number of average monthly searches for your desired keywords. It's also free! Here are some of the best alternatives to Google AdWords for PPC. SEO By Yoast: This is a must have a plugin for every WordPress user. This plugin helps you optimize your blog posts properly for search engines. It will also help you find the right keyword density to increase your search results for any keyword. It's a free plugin btw! 2) Scrape together top 10 results and add them to ahrefs backlink search. 3) See where they have got those links from. 4) Email to those webmasters saying that I've put together something similar and it would be nice if they could mention it on their page. Buzzstream- This is mainly to keep my email outreach targeted and organized. In that way, I can follow-up if someone hasn't answered to my initial email. I can also keep those contacts for future projects so I can email them later again and build a relationship of some sort. Broken Link Building: This is for finding broken link building opportunities. It'll cost you some money, but you can easily type in your main keyword - for example, "blogging" and broken link building tool will give you some results for pages that are related to blogging but are no longer available (404 error, page down, etc.). Once I've found something, I'll get in touch with people who have linked to the site previously and tell them that the site is down and they could replace it with my OWN site. and all the link data providers (in aggregate). Then it’s good old Excel and Google.com usually for the rest. Adobe Creative Suite- Essential tool for creating awesome infographics. SEMRush- Great tool for keyword research that will also help you think of ideas for content. Majestic- Helpful for analyzing and auditing backlinks. MOZ – similar to MajesticSEO however with some differences - useful to compare metrics and also offers the ability to compare your site with other competitor sites in detail. Google Webmaster Tools – the inbound links section can give some really good detail into who links to you and from what pages (it’s free as well). Buzzsumo, SEMRush and Ahrefs Top Content. Below are my 3 preferred SEO Tools for Link Building! LongTailPro - I love this tool. I've integrated with my Moz free account to analyze the competitors and their links effortlessly. Not only to look the links, we can see their PD, DA, PR, Moz rank, juice passing external links, etc. with this awesome tool. Google Webmaster Tools - Regular use of this valuable tool helps me to understand better about my links and keywords to focus. Open Site Explorer - I use this vibrant tool to get insights about the links that points to a particular page. Ahrefs- To keep track of my link profile and make sure things look organic and healthy. MozBar: One of the tools I use on a regular basis is the convenient extension MozBar, which is both free and quite intuitive to use. Checking the Domain Authority of sites is a must for anyone who is working in the SEO industry so it's something I cannot work without. SEOquake: SEOquake is another neat (and completely free) extension for Chrome and Firefox, which I use to view any site’s statistics while browsing. You can modify the different metrics to be displayed, such as Google and Bing indexed pages, external and internal links, keyword density, social media stats, and Alexa rank, etc. It saves me a ton of time for checking each of these individually. Open Link Profiler: Perhaps the one I find the easiest and most straightforward to use is Open Link Profiler. For a free tool, it’s amazing how much you can get out of it. I use it mostly to scout specific backlinks leading to a site as it has some very handy filters and a number of options for tracking backlinks in real time (it’s updated daily) and the results go back for the past six months. I’ve used quite a few backlink profile checkers, but this one seems to work best for me. Buzzstream: BuzzStream is one of those tools I use for link building campaigns; it is hands down the best enterprise-class outreach management tool out there for me. It gives you an easy top down view and trusts me, it is incredibly intuitive. Majestic SEO: It's one of those tools I used in the early days of blogging; I was introduced to this tool by a friend. Majestic SEO is a software package, which is focused on providing information for link building, reputation management, competitive link analysis and website traffic analysis. In all this, competitive link analysis and for A standard link audit has been what I use this tool for. Believe me to the tool is a very nice one regarding backlink exploration and building a reputable link building strategy. Link Prospector: This is yet another tool I've given a try, but not frequent with it, the little time I had with this tool is enough to testify. Link Prospector is a link building research tool that is designed to find and return lists of potential partner sites. Built for speed, the tool can return a huge amount of data link builders can sift through to find link building opportunities. One reason why I like this tool is the fact that it has a clean and simple interface and has the ability to export what it finds. Talkwalker- For social media analytics. Apart from above three, I also use Majestic SEO. Majestic SEO: I am using Majestic SEO for backlink checking. Link Research Tools: I use Link Research Tools for link building. Link Detox: I use Link Detox for Link Audit and Link Risk Management. finally a good email platform like MailChimp for building contact lists and doing outreach. 1. Ahrefs: This is my main tool for links and keyword tracking. The ability to check the top content on ecommerce websites is really valuable to select the right articles when requesting backlinks. 2. Keywords Everywhere: I use their Chrome extension to quickly find keyword ideas based on volume for blog posts, one of the best keyword research tools that is available for free. 3. NinjaOutreach: My favorite tool for researching link opportunities, finding the right influencers and articles matching keywords I'm targeting. It helps keep the email outreach organized, scheduling follow-ups and managing contacts. Ahrefs or Open Site Explorer - These tools help me in prospecting for links to my websites. Both are also great tools for backlink analysis and poaching links from your competitors. Buzzstream- Using BuzzStream I do SEO by connecting to influencers and experts within the industry. I then leverage my relationship with them by collaborating on a blog post and getting a backlink on their site. Buzzsumo - This helps me find the most viral content for my target keyword and lets me create a better content out of the results using Brian Dean's Skyscraper Technique. Huge Thanks to all of you for your time and being so kind for the response. Please share this, if you found this useful. Keep visiting us, for such kind of case study and Experts Round Ups. I will love to know your response too on this in the comment. If you are looking for more such tools, you are recommended to check this article. If you could use only 3 SEO tools for your link building campaigns which 3 tools would you choose? 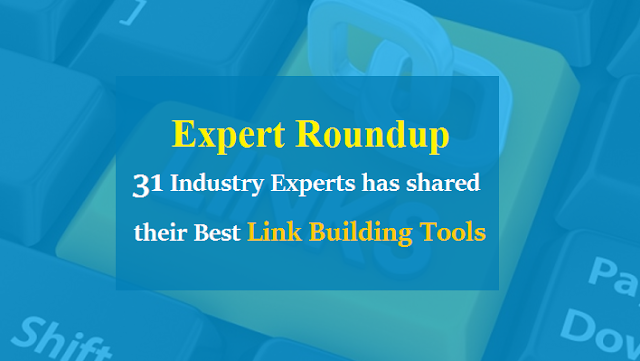 64 comments to ''31 SEO Experts Reveal 3 Favorite Link Building Tools"
Nice to know which all tools are being used by expert. Glad to see myself along with these experts. Thanks for sharing Ashutosh. Thanks Atish for the comment and Support. Thanks for including me in this great post, Ashutosh! I really like Sophie's answer - good old fashion blogger outreach at its best. I really missed it, though you asked! This is indeed a wonderful list, you presented it well. 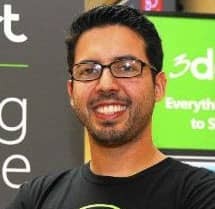 I use SEO by yoast, Alexa and Google. I need to give a try. Thanks Phil for visiting and comment !! Thanks Kostas for your valuable time and Support !! You've done a great job by consolidating the amazing link building tools at one place. I'd say that it is a good opportunity for the bloggers to learn some unknown blogging tools and I've learned a lot here. Good to check the exciting reactions of these experts and their preferred tools to build links. Thanks for adding mine too. Keep your good work. Thanks Nirmala for the comment and the help !! I appreciate your great efforts with quality analysis of SEO tools referred by popular bloggers in blogging industry. This info is very helpful for bloggers specifically for newbies who seeking to build their blog's backlinks. Thanks for sharing this valuable info with us. Thanks Gangadhar for your nice words and Yes i hope this will be a great help for the bloggers. Ahref and Buzzstream seem to have taken top spots from this post. I don't use any of these tools but would be glad to access why the industry experts are rooting for them. The use of any link building tool should be done with tact so that accurate analysis of competitor position and what the search engines want is analyzed per time! I have shared this comment in kingged.com where this post was found! These tools are great help in link building and SEO campaign. Keep visiting. Thanks Nik for the comment and bookmarking !! That great Ashutosh, good study conducted... and thanks for the useful information... like it..
Good to know the tools used by pro bloggers.Thanks for sharing useful info. Thanks Ghouse for visiting and comment. What a great list of tips from experts here, Ashutosh . It's good to read so many link building tool alternatives. Thanks Much Erik for your help and visiting. Thanks for this wonderful compilation Ashutosh - helps us see what tools others are using :) Indeed quite a big list (and variety) of tools. Thanks Jane for your help in completing this and thanks for taking your time. Mahadev Bro- Thanks for your nice words :) Hope this will help you all. You did a great job by sharing this wonderful expert roundup and solved a long-standing problem of newbie and struggling bloggers to pick the best link building tool. Many people hesitate to invest just fearing they may be getting lesser rate of return on buying a wrong tool. But here in this post you put the quantified opinion of all these experts to buy the best tool. Thanks for sharing and also thanks for including me in the list. Thanks for including my opinion with these top notch bloggers. Newbies will get lot of help with this wonderful post. You have chosen some great and good no. of bloggers. I don't know most of them. I would try to visit them soon. I also use ahref and buzzsmo. They are fantastic and I would also recommend this to others. Thanks for the amazing post. Keep it up. ENjoy your day! Thanks for putting this together. There are quite a few broken links e.g. Neil Patel and Erik Emanuelli. Thanks Joe for pointing. We had a technical issue and so these error came in URL. Now all have been corrected. All details are together in one form for future reference, Thanks Ashutosh Jha. Thanks.Good collection. It'll help me out and new bloggers. Ashutosh, This is a great article coming from different experts. I really appreciate your work on 31 people just to put this list up! I definitely agree with Ahrefs and of course Google Products. It's nice that you put up each of the voters links. It will greatly help your readers have a wide expanse of choices to experiment on. We actually have articles in our site about SEM, SEO and related stuff too. You might want to check them out and see perhaps one day we'll be in one of your posts haha cheers mate! Great job! What’s your present effective link building tool? Can you please share with us? This post contains ultimate collection of SEO Tools. ahrefs is my favorite tool. I like it because it is frequently updated compared to other tools. This is my second visit to your blog.I am looking a update for this post. Nice work. Openlinkprofiler is also a good to get backlink report of your comeptitor as it gives you report of upto 1000 backlinks for free. Amazing Blog and very helpful. Thank you sharing with us. Great Post. Such insights work amazingly well. I have tried all three: Ahrefs, BuzzSumo and SMERush, and I can confidently say they are the best tools available in the market. Sharing it with my followers. Thank you Bhupendra and glad that you liked it. Excellent post. I am looking for such kind of info for long time. Thanks for sharing. This is really a nice share. Getting to know about link building tools and that too by pro bloggers is a win win deal. Nice list of link building tools, but I heard that building links manually is actually better than building links using automated tools, of course I agree that building links using automated tools is hassle free and not time consuming but don't you think it may harm the sites to get links from unwanted sites and completely unrelated sites? Anyhow the list is informative and I think I should give it a try. Keep posting great stuff. Thanks for stopping by. I agree to you that manual link building is best but these tools don't provide the automated links. These tools will help you to analyze the links of your competitors' and based on it you can make links by analyzing. So basically these are SEO tools helping in complete SEO project. Hope that clarified. nice article and ways to build links... i think building links are must and for new bloggers to rank high these links serve as backing... thanks once again as i really loved the way you have expressed and written the tools for building up the links! Great article about SEO strategies. Your 31 SEO experts mostly important for me. Thanks. The given information is so useful that i have bookmarked this page. What else i can say, the tips which i have found here are awesome. That's a Great collection of Link Building tool.And for a newbie like me it is a Gold mine of Information. Thanks for Sharing it Sir.